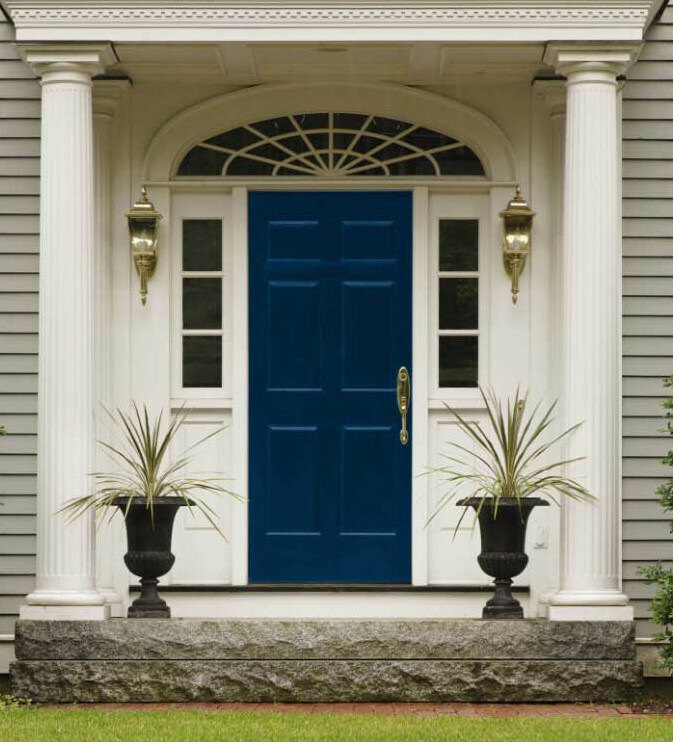 The shade of blue on a front door can range from sky to navy or even lean towards teal. The color of the front door counts. Why? Because color sends a message about mood and taste of the people who live in the house. However, I don’t feel that blue on the door translates as sad — although “the blues” have that connotation. 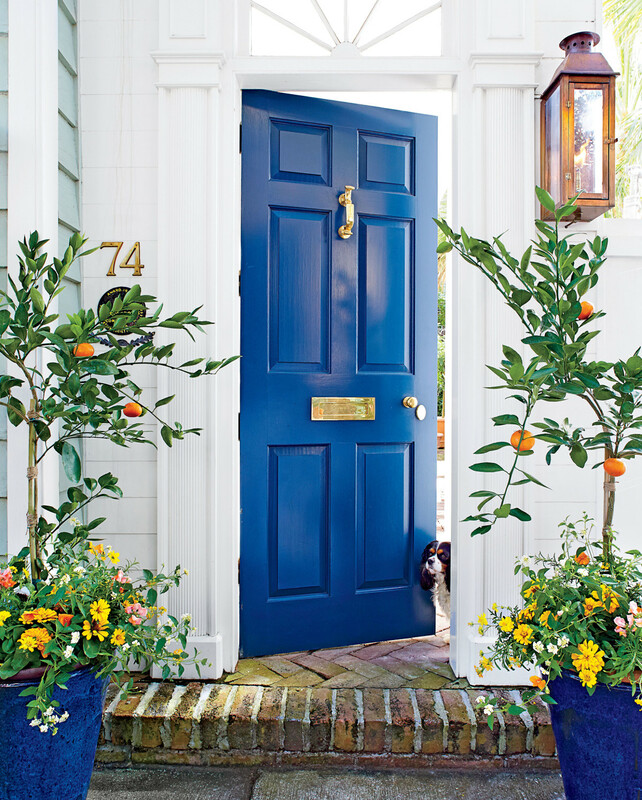 For me, a glossy cobalt blue door on a white house reads as traditional and elegant. After all, cobalt is the “blue and white” blue that’s been used on everything from ceramics to carpets for centuries. Navy blue is even darker than cobalt and more conservative. It’s not as doctrinaire as black and yet it conveys the same authority. On this house it takes itself seriously. The color is Beauti-tone’s French Navy Blue. Beauti-tone paint is sold exclusively at Home Hardware in Canada. 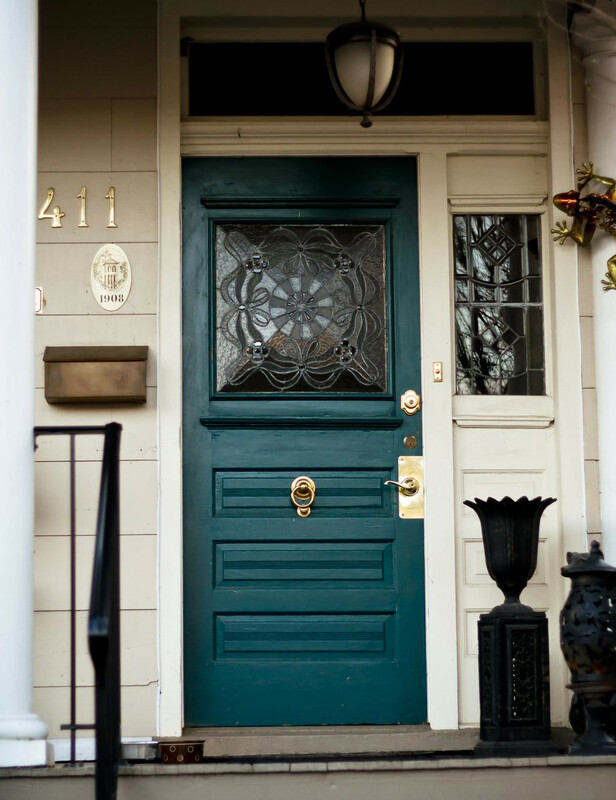 A gray-blue door seems more subtle than either cobalt or navy because it’s muted. This elegant entry with its historical stone entablature even bears a date — 1742. 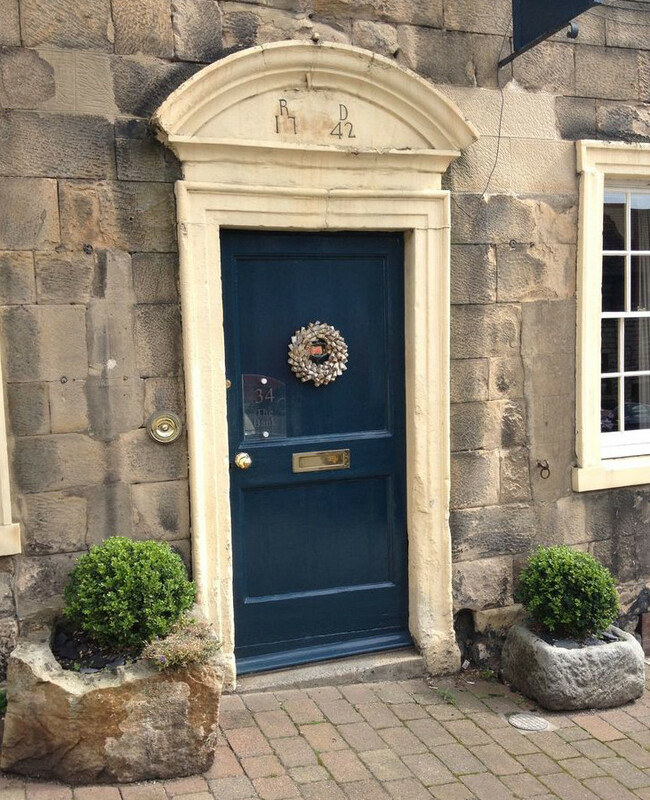 So it feels like a perfect choice for Farrow and Ball’s Hague Blue which, according to the color card is “a strong blue, reminiscent of Dutch external woodwork.” It marries perfectly to the beautiful stone. Here’s my front door. It’s another Dutch-inspired color, Fine Paints of Europe Zuider Zee blue. Midway between powder and cobalt it looks just right to me with our cedar shingles and, as blues go, it feels downright happy and welcoming. I’d love to call this blue warm, but blue is a cool color. Sky blue is popular for porches in many parts of the country. 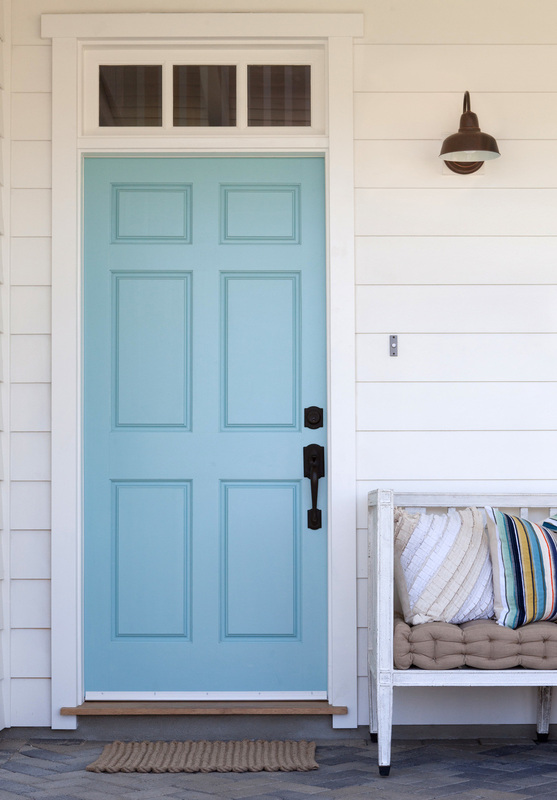 Here, Benjamin Moore’s Tranquil Blue feels beachy even though it’s the entry to a colorful cottage in Texas. Clean, crisp and cheerful, pale blue seems like a no-brainer color, particularly for a white clapboard home. Then there is teal. That’s a mid-range green-blue and it’s a much more unusual choice for a front door. For me it bespeaks a more historical style, perhaps Craftsman or Arts and Crafts where rich jewel tones were often used inside. 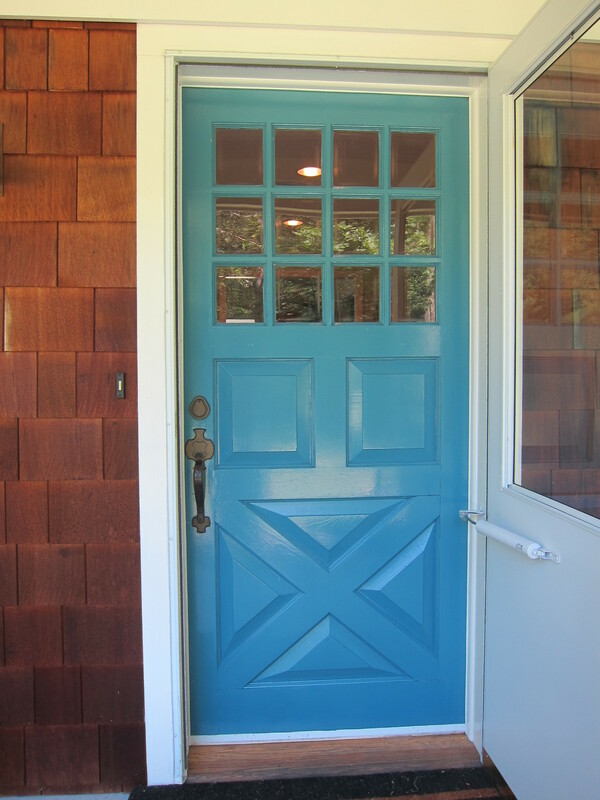 While I don’t have the exact color of this attractive door it looks very close to Benjamin Moore’s Dragonfly, which was sampled some time ago in my Blue-Green Kitchens post. It seems fitting, too, since this she is often seen on the wings of dragonflies (and peacocks) and early 20th century architecture in those styles was especially inspired by the natural world. For anyone interested, here is a brief summary of the meaning of blues — from sky to navy. Your site is absolutely gorgeous, Roc. Excellent touch to this home, adding single pops of color to the front door can transform ones home. Thanks for sharing this article!